Microsoft is no longer releasing updates for the Junk Mail filter. Junk email removes spam from your mailbox using built-in filtering capabilities. The junk mail feature is highly accurate when set on High and you can add specific addresses or domains to the Safe Senders, Safe Recipients, and Blocked Senders lists. To view the options, open Tools, Options, Junk Email settings. Beginning with Outlook 2010, each account has it's own Junk Mail settings. Select a message in the account before opening the Junk email dialog. We’re seeing a lot of queries in the forums where people are creating rules to delete spam and adding hundreds, if not thousands, of domains to the Blocked senders list. It’s an awful lot of work to create rules that do what Outlook’s junk filter already does very well. Because there is a limit to the number of entries on the Safe and Blocked lists, you should limit the number of entries on the blocked list to those addresses that email you over and over and to which you cannot get unsubscribed. 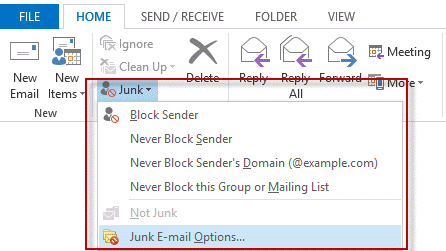 To check or change your Junk email settings, expand the Junk button on the ribbon and select Junk E-mail Options command. The Junk E-mail Options are on the first tab of the dialog, with safe and blocked senders on the other tabs. Additionally, you can block email by top level domain, such as .RU, .TW etc. Set the Junk filter on High and let it move mail to the Junk Email folder. Disable the option to “Trust mail from my Contacts” on the Safe Senders tab. If you have a contact for yourself, any spam sent with your address in the from field will be trusted. If mailing lists are caught by the junk filter, add their address to the Safe Recipients list. You shouldn’t need too many addresses on the Blocked Senders lists and won’t need to import a huge list immediately. My blocked sender list contains one address—the address of a person who likes to forward me a lot of junk. Smaller really is better for the blocked list. Every few days, take a few moments to scan the junk mail folder for false positives—something you can do while waiting on hold while making phone calls. Once scanned, right click on it and choose Empty Junk Email. After you add newsletter addresses to the Safe senders list, you’ll find few false positives, but I don't recommend setting it to delete messages immediately. My problem with this option is that the settings never stay. Soon as I close outlook (Not Minimize to tray), the junk email settings revert to none. What type of email account do you use? (IMAP, POP3, Outlook.com, Exchange) Are you using any programs that access your outlook email - this is most often sync software but could be other software too. Unfortunately, everything goes to junk email even if I have it at 'no filtering' and have no blocked senders. Why can't 'no filtering' mean 'no filtering'. I've got important work emails going to junk so I have to go over there and weed through everything to make sure I have missed something important. Hate this new office product. Won't renew next year. Changes are that something other than outlook's junk folder is moving the messages. Open messages in the junk folder and look at the yellow bar - does it say outlook moved them? do you use a samsung phone? there is a known issue with the junk filter in their mail app that moves exchange email to the junk folder. Question: for junk mail can I migrate the junk mail settings built up over many years from Outlook 2003 to Outlook 2016? If so, what file(s) do I need to move from which folders to which folders? Or is there an export / import operation I can do? You can export the safe and blocked senders list (in junk mail options) but if you are using Exchange or pop3 (and use the same pst) the settings should migrate to the new profile. From what I am reading, most of the problems seem to be with "automatic" junk-picking which I have set to "Off". I created a custom button for "block sender" and another for "blacklist" by customizing the Ribbon using options from 'All Commands' but I would like to add a keyboard shortcut for same. I don't see any options for junk-mail in 'quicksteps' which has the create hotkey function. Is there another way to create a custom hotkey for a specific action such as this? I searched everywhere but knew if it existed you would know where to find it. Diane, thanks for the article. I have the question. How can I set Junk filter from High to Low in registry? What registry keys will I change or create if it doesn't exist? It is a registry entry, but the registry is account-specific in newer versions of outlook - this makes it difficult to change the key using a reg entry. You'd need to search the profile keys for the value and update it. I've done this, but I still get WAY too many false positives in my junk mail folder. Including messages from people & groups I have marked as trusted over and over and over again.